While Katkit13's idea of a quilt over the new bed is lovely. I don't think that's the route I want to go. 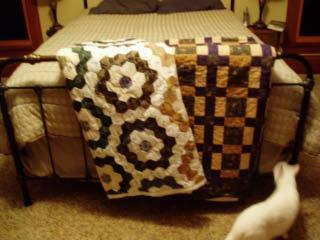 See my mom's hobby is quilting and she is amazing. But we have amassed quite a collection in the master bedroom already. I'm just looking for a little some thing different. This is the view across from the bed. She made this one for us for Christmas 2002. Tim picked out fabric and I chose the pattern. 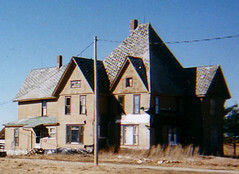 The quilt on the left was done by a family friend of Tim's. 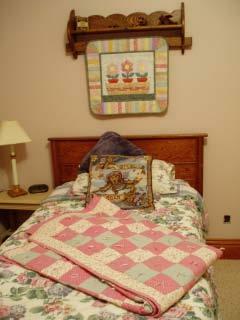 The quilt on the right was a wedding gift from mom. She didn't make this quilt for us. But I loved the colors in it, so she gave it to us. It works beautifully in the big bedroom. 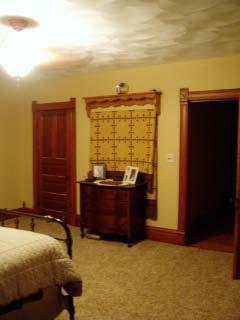 The wall hanging is a pattern created by my Aunt Carla. 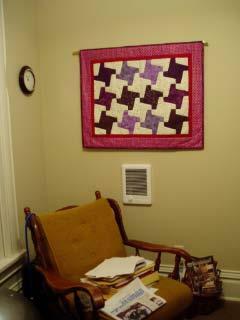 Another talented quilter in the family, who also designs patterns. The quilt one the bed was a 4-H project done by yours truly. This wall hanging was done by mom as last years birthday present to Tim. It hangs in his office. I think it matches great with all his airplane stuff because the pattern reminds me of propellers. What beautiful quilts! Your mom is very talented! I'd go with a stained glass piece of something from the house that you frame to keep as memorabilia. Good luck with your decision and I can't wait to see the pictures when you decide what to put there. You're quilt rich. (awesome btw, my mom is on her 17th or 18th quilt - I love looking at them). It was great to go through your post. 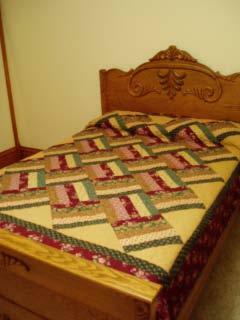 I just loved those beautiful quilts. Thanks for sharing here. Keep up the good work.